ESSENTIALS: Open Tuesday to Friday 11 to 3 a.m., Saturday and Sunday 10 to 3 a.m., closed Mondays. Street parking is challenging in Port Jefferson, and this second-floor space has no wheelchair access. Chips and salsa, tacos and burritos, step and repeat. 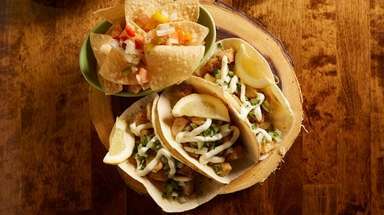 In the sphere of Americanized Mexican food, the choices can seem caught in a continuous loop, which makes the approach at Barito Tacos & Cocktails in Port Jefferson Village feel refreshing. Here, tortilla chips become giant rounds to be broken apart by hand. 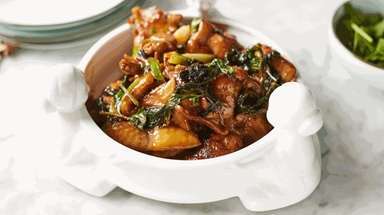 Enchiladas can be filled with pork belly, and among the pupusas (a Salvadoran staple) is a version topped with duck confit. There’s even fried rice laced with cotija cheese. 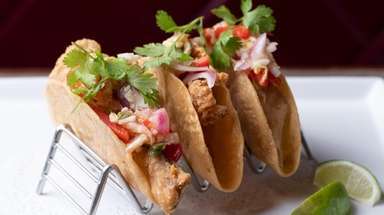 The slightly mischievous approach comes from chef and co-owner Steven Scalesse, also the chef at Bay Shore’s Tullulah’s and former chef and co-owner of The Magic Taco, a well-regarded taco shack in Islip Terrace destroyed by fire three years ago. 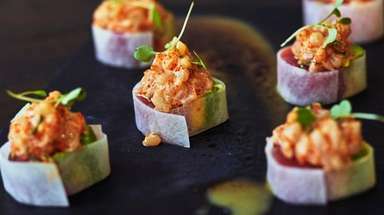 Scalesse and head chef Kevin Breeden have resurrected the offbeat Magic Taco formula inside the soaring second-floor space above Starbucks that once held The Arden. Gone are that gastropub’s mahogany tones, replaced with whitewashed walls, Aztec-style murals, a refurbished centerpiece bar and generously spaced tables. Ever been packed shoulder to snout in a tight dining room? It’s the opposite here — room to breathe, stretch and talk discreetly. Barito is not easy to find; its only street presence is a sign and a door next to Starbucks which leads to a set of stairs. Servers are unfailingly warm, though are often distracted by ongoing conversations elsewhere. So order some of those round chips early on, but pass over the pale, insipid pico de gallo for the much better guacamole, chunky and bright. When the chips are fresh, they shatter with a little snap; when they’re stale, as they were one night, brittle shards will fly into the air as you crack them apart. Some starters are pitch perfect, such as the restaurant’s gossamer chicharron, or fried pork rinds. Crema-drizzled street-corn fritters, which look like French fries and taste like fried polenta, have crackling armor and steamy insides. A cooling ceviche with chopped tilefish, cubed mango and pickled onions, was marinating in a punchy lime dressing — though I wished for a touch more heat. Tacos come two to an order on house-made soft-corn tortillas, and all are finished with shredded cabbage, pickled onion and a touch of pico, which make them feel slightly one note. Carnitas (slow-cooked, pulled pork) are among the best — smoky, slightly sweet and silken. Then there was the incident of “seasonal fish taco.” Scallops, we were told. What arrived, however, were battered, fried fingers of white fish. Pupusas, those pockets of cheese-filled dough made from ground corn that run about $2 from a pupuseria, are $10 to $14 each here. The prices elicit curiosity: Could this be the queen of all pupusas? Turns out, they are pillowy and especially delicious when topped with fatty duck confit — though at $14 a pop, maybe not flying from the kitchen. Some fusion falls flat. Barito’s fried rice, which earns cross-cultural points for the marriage of Mexican cheese and Indian basmati rice, tastes like something you might make at home with leftover vegetables. The words “pork belly enchilada” quicken the pulse, but despite racy green salsa baked into its edges, these enchiladas are dry, with barely a smear of cream on top, very little cheese and a filling that tastes dirty. Barito’s cocktail menu reaches beyond margaritas, but not always with success. A vanilla-laced tequila drink called Anticuado is plodding, and a Paloma, a blend of tequila, imported Jarritos grapefruit soda and lime, often served in a dainty tall glass, is gracelessly poured into an ice-stuffed pint glass branded with a Dos Equis logo. A floral white sangria eclipses both. 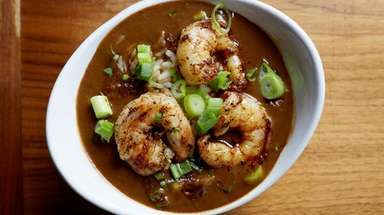 During weekend brunch, Barito plates things such as chilaquiles, that breakfast of salsa-bathed tortilla strips topped with fried eggs, and fluffy masa pancakes with molten apple butter. Breakfast burritos, though, are studies in dryness, and, curiously, the only dish with any kind of chili-fed heat. 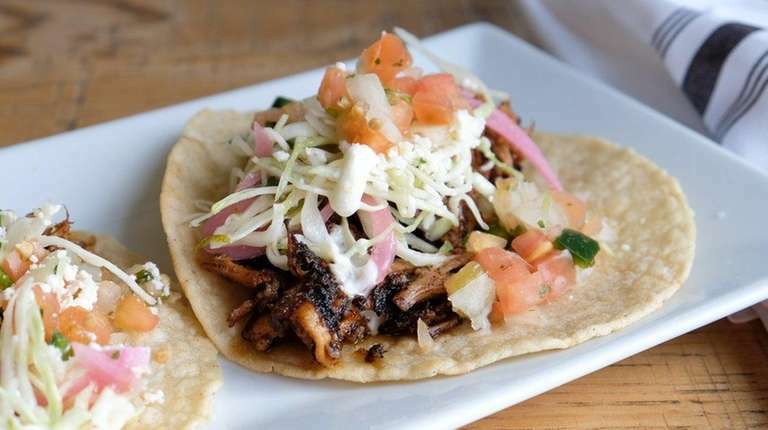 Barito’s inventive spins on Mexican and Central American food could be a welcome addition to Port Jeff’s dining scene — that is, when and if the uneven kinks are smoothed.